We were switching energy providers for last week's Finance Fridays. 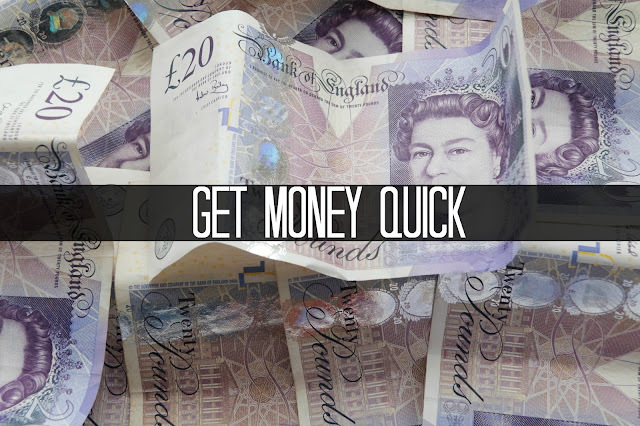 This week we are looking at ways to get money quick. Sometimes it doesn't matter how well you plan your finances. Just as you thought you are on top of things you are landed with an unexpected bill. Many of us can't do without our cars being off the road or a broken boiler but such bills can run into hundreds if not thousands of pounds. At times like these we need to raise money quickly. Some of these ideas will earn you cash straight into your pockets whilst others will take a bit longer and take a bit more work. Whatever method you choose will depend on your situation and how quickly you need the money in your hand. Sell your stuff – If you look around your house and search through your loft and garage you'll probably find a whole load of items you can sell. There are various methods you can use to sell things depending on the actual items and how much time you have. If you want to sell books, CDs, DVDs and computer games try specialist sites such as Music Magpie, Ziffit and We Buy Books. You can scan the barcode of the items and then see how much they are worth depending on the condition of the items. Then you send them off and await payment when the company receives and checks your goods. For general items eBay and Gumtree always remain popular. Remember it will take time to photograph and list your items but they may not sell and on auction items you are not guaranteed a price. For larger items such as furniture, kitchen household electrical goods, prams, bikes and bundles of clothes you could try Facebook. There are a number of local selling groups on Facebook you can join or sell through Facebook's own selling application. If someone wants your advertised item you could arrange pickup and collect your money within hours. If you can wait until the weekend bundle up your unwanted items and take them to a car boot sale. After the fee for your pitch everything you make goes directly into your pocket. Matched betting – I've written before about Matched betting. Basically it's a way of finding free bets from online bookmakers and then putting the right odds together so you can't fail to lose. It does take a bit of thought to get your head around the concept and there are many guides available to help you through the process. There are also companies you can pay a fee to which will find the right odds for you. It's not something I have done personally but I do know other people who regularly make hundreds of pounds from it. As it is classed as gambling winnings are also tax-free. Mystery shopping – Get paid to shop! Companies need to know what their customers think of their services so are willing to pay people to try out their shopping experience. These opportunities may not come up at the right time for you and don't pay a lot but may help towards your overall total. Online surveys – Everyone has an opinion and you can get paid to have it heard. You will need to answer a lot of surveys to get to the cashout amount but you can do these surveys whilst watching television. I have heard recently of people earning £300-400 a month through answering surveys, watching videos and playing games through Swagbucks. Deliver stuff – If you have time before or after work or even a couple of hours during the day look out for companies wanting their leaflets, newspapers and booklets dropped through letterboxes. Offer your services – You may not think you have any skills but people are willing to pay for simple services. Put notices up in local shops offering to babysit, walk dogs, feed pets, iron clothes and tidy gardens. Credit card – If your credit score is good enough try applying for 0% interest purchase credit card. Once approved you could pay your bill on the credit card and then pay it back in monthly instalments. Don't be tempted to keep spending on it and make sure you pay it all back before the 0% interest period ends to avoid paying any interest on the amount borrowed. Loans – If you know you can pay the money back within days then quick loans could be an option for you. If your application is approved you can have the money in your bank account with a couple of hours. Do be aware the interest rate on these types of loans are high as they are only designed to tide you over for a short amount of time. You will need the means to pay back the loan in the specified time. If you want to join in with this week's Finance Fridays then add your link to the linky below. Any post concerning financial matters is allowed. Full details here. It doesn't have to be published today as you have until 23.55 on Tuesday 21st February 2017 to join in. Brilliant advice , I'm a firm believer in eBay . There are some great ideas there - easy but easy to overlook :) I really need to clear out some of my rubbish! There are some great ways to get cash quickly. I do hope that people try everything possible before looking at any sort of payday or quick loan.